At Hotel Union Square in the heart of downtown San Francisco, not only will you fall in love with the striking history of the hotel, but you will also fall in love with a unique hotel filled with both genuine and award-winning personality! 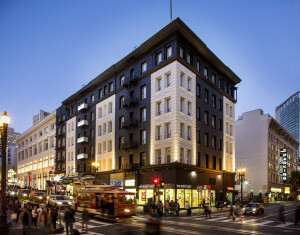 Though Yvonne Lembi-Detert, the CEO and President of the Personality Hotels group, designed Hotel Union Square some 30 years ago in 1982, the hotel is actually San Francisco’s first boutique hotel (the pre-war version of the hotel graced San Francisco even before the major earthquake of 1906, with major renovations in 1913 for the 1915 Pan Pacific Exposition). From the original 1915 Egyptian tile mosaic murals in the entryway to the old basement that runs the entire length of the building itself and at one time held one of San Francisco’s largest and famous speakeasy’s (The Golden Bubble, a 10,000 square foot speakeasy that was rumored to hold over 250 people and purportedly included a slide at one of the entrances) back during the Prohibition Era, Hotel Union Square is filled with both urban and traditional ambience, wonder, luxury, and mystery! 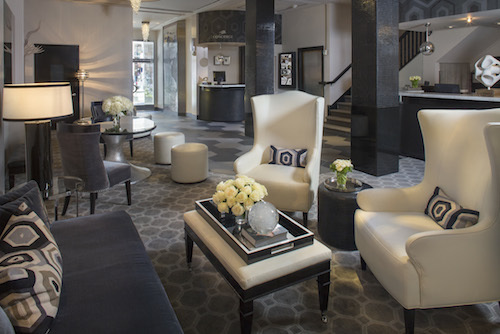 The art-deco inspired lobby is home to a wonderful selection of staff and hotel events, such as the evening wine reception with live music and complimentary coffee and hot chocolate in the mornings. Heather Noll, the President and Founder of Chalkboard Communications, and the General Manager of the Hotel Union Square, Domitille Montoro, will go out of their way to ensure that every stay at the hotel is one worthy of countless memories! I even had a glitch with my flight arrival and Heather made sure that everything was arranged and taken care of, ensuring that a stressful stay was NOT one of the things on my list of to-do items! Domitille went out of her way to make sure that everything in my room was to my liking and, as a fun and added feature, was able to also show me the stupendous Dashiell Hammett Suite, where Dashiell stayed with his wife-to-be the night before the wedding and which includes Dashiell’s original writing desk. In addition to the Dashiell Hammett Suite, Domitille also explained the hotel’s history and a few of the other suites that were available to guests at the hotel, such as the Dugout Suite (for Giants fans), Penthouse and Junior Suites. The hotel also offers a great selection of rooms, such as the Executive King and Queen Rooms, the Deluxe Rooms, which can be queen-sized or double-double sized and include all of the wonderful amenities of the other rooms, such as flat screen T.V.’s and mini fridges, the Sleep & Soak Room (with soaking tub and an oversized rain shower-head) and the No Frills Double Room. One of the most exciting offers by the art deco-inspired Union Square Hotel, which is actually but one of four exclusive San Francisco-based hotels (there are six altogether) directed by Yvonne, including Hotel Diva, Kensington Park Hotel and the Steinhardt Hotel, is the amount of attention paid to mothers traveling with children in the form of the remarkable and entirely engaging Kids’ Suite, which actually sleeps up to two adults and two children. In other words, this room is the true definition of a suite! 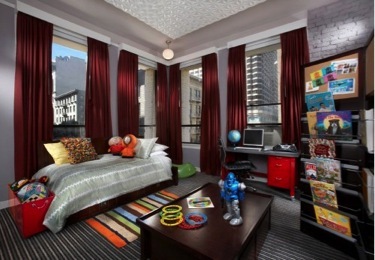 In addition to the plethora of puzzles, reading books and activities, toys, and other assorted knickknacks for children, there is also mixed-media collages around the suite of famous kid-friendly landmarks around San Francisco, a computer for kids with history-filled games and a writing desk for kids. Additionally, the suite comes with a cherry wood trundle bed, a Nintendo Wii and a host of other delights for children of every age. What’s more, the very same partition which holds all of the reading and activity books also serves as a room divider without having a complete wall or partition blocking children from the view of parents. On the other side of the moveable partition, parents who wish to stay in the same room will find a large king-size bed, T.V. and writing desk at their disposal. To book this suite, be sure to contact the hotel at 800.553.1900. One of the refreshing qualities that places the Personality Hotel group an echelon above all the competition is its constant attention to renewing itself in a city known for being grounded in history. 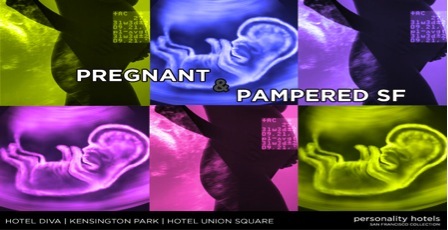 As it turns out, Hotel Union Square, as well as Hotel Diva and Kensington Park Hotel, have just launched a new pampering/travel program geared toward expectant mothers – the first of its kind in San Francisco! 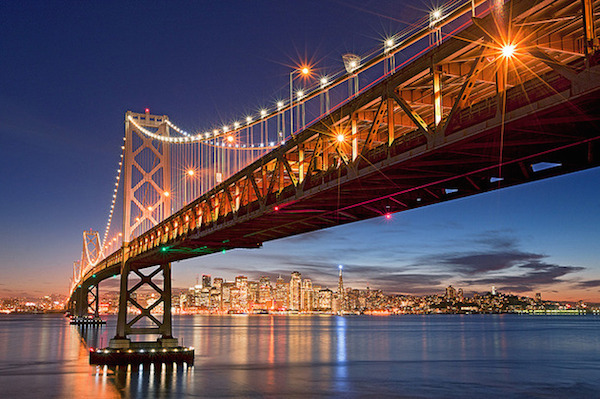 The new Pregnant & Pampered SF Getaway package is at its core a celebration of motherhood, growth and renewal, and its strong appeal has attracted many local businesses in the San Francisco area to team up with Personality Hotels in an effort to celebrate this milestone achievement in women’s lives. In the past, travel and pregnancy have always focused on couples, often with the advice that mothers-to-be should stay home and refrain from traveling. This entirely new concept put into effect by Yvonne Lembi-Detert actually celebrates the mom-to-be, and ensures that she has everything at her disposal to enjoy a wonderful experience full of luxury and hospitality before childbirth. A Massage Therapy Bar that happens to be made from 100 percent organic cocoa 7 Shea butters (from Lush Cosmetics™). A welcome roll of Tums, in case heartburn happens to strike! A twenty percent of voucher that can be used for a future stay in Hotel Union Square’s Kids’ Suite or the Little Diva Suite at Hotel Diva. Alternatively, you can visit http://info.personalityhotels.com/packages or call 800.553.1900 for more information!